Do you have a need to extend Microsoft Dynamics CRM 2011 and Microsoft Dynamics CRM Online by writing and integrating custom code? Whether you are writing a plug-in or a custom workflow activity, you will use the Plug-in Registration tool, provided in the Microsoft Dynamics CRM SDK, to register your custom code with the Microsoft Dynamics CRM system. This article complements the documentation in the SDK by providing detailed information on how to use the Plug-in Registration tool to register custom code with Microsoft Dynamics CRM 2011 and Microsoft Dynamics CRM Online. However, registering custom workflow activities with Microsoft Dynamics CRM Online is not supported using the registration tool or any other means. A plug-in is custom business logic that you can integrate with Microsoft Dynamics CRM 2011 and Microsoft Dynamics CRM Online to modify or augment the standard behavior of the system. Plug-ins are event handlers. They execute in response to a particular event being fired by the platform. You can also write custom workflow activities to add new functionality to processes (formerly known as workflows) that you create. After you write (or purchase) a plug-in or custom workflow activity, you must register it with Microsoft Dynamics CRM. The Plug-in Registration tool is one of three ways you can register plug-ins and custom workflow activities. The other two methods are: by adding a registered plug-in or custom workflow activity to a solution and installing that solution or by writing custom code that uses the SDK plug-in registration classes. When developing a plug-in or custom workflow activity, the most common registration method is to use the tool. Later when you are ready to package your code for production deployment, you can make use of solutions. This article complements the plug-in registration walkthrough provided in the SDK by providing more information about the Plug-in Registration tool itself, where the walkthrough focuses more on the process of plug-in registration. The information in this article applies to all three Microsoft Dynamics CRM deployments: On-premises, IFD, and Online. The Plug-in Registration tool is provided as a source code sample in the Tools folder of the Microsoft Dynamics CRM SDK download. Review the instructions provided in the Tools/PluginRegistration/Readme.docx file for more information about the tool and instructions on how to build the tool. The first operation to perform with the tool is to connect to one or more Microsoft Dynamics CRM 2011 and Microsoft Dynamics CRM Online servers. You can do this by selecting the Create New Connection button in the toolbar. Enter the connection information for your target Microsoft Dynamics CRM server in the Connection Information part of the Connections pane, and then select Connect. Notice that you are just entering the http[s]://server-name[:port] part of the discovery URL. 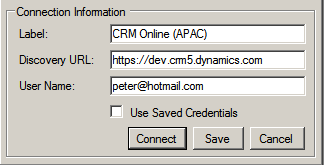 Enter the user name and password of your Microsoft Dynamics CRM user account as appropriate for the type of server you are connecting to. For information about obtaining the URL for your server from the Developer Resources page of the Web application, see Download the Endpoints using the Dynamics CRM Developer Resources Page. A list of organizations that you are a member of is shown in the Connections pane. Select an organization from the list and click Connect or just double-click the organization’s name. A view of registration information related to the selected server and organization is opened in a tabbed pane. Each server and organization you connect to gets its own tab. Select Save if you want to save this connection information for when the tool is run again. The Reload Organizations button in the toolbar refreshes the connections list and the Remove Connection button deletes the selected connection from the list. The main window of the tool is shown in the following figure. Notice that Connections pane has been closed in the figure to conserve space. The Registered Plugins & Custom Workflow Activities list displays assemblies, plug-ins, steps, images, custom workflow activities, and service endpoints that are currently registered with the associated server and organization. 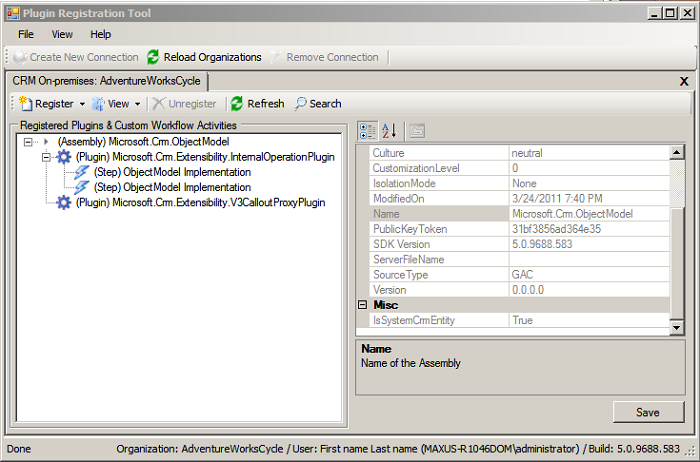 By default, the Microsoft.Crm.ObjectModel assembly and its related plug-ins and steps are registered with the system. The tool does not allow you to unregister these objects because they are required by Microsoft Dynamics CRM. You can expand the nodes in the Registered Plugins & Custom Workflow Activities list and select any list item to view registration information about that selected item. You can change the way the list is displayed, according to assembly, entity, or message, by selecting a view in the View menu. To register a plug-in or custom workflow activity, you must first register the assembly containing that compiled code. You register an assembly by selecting Register New Assembly in the Register menu and then filling out the dialog box that is displayed. At the top of the figure in Step #1, I selected the ellipsis button … to the right of the text field and navigated to a plug-in assembly that I built from the SampleCode\CS\Plugins folder of the SDK. Next, in Step #2, I checked two plug-ins to register: AccountNumberPlugin and FollowupPlugin. If instead of plug-ins these were custom workflow activities, I could then just click Register Selected Plug-ins and be done. However, when registering plug-ins, you should proceed to Step #3 and Step #4. In Step #3, check Sandbox to register the selected plug-ins to execute in the sandbox, an isolated run-time environment. Otherwise, select None. Always specify None when registering a custom workflow activity. In Step #4, specify where on the server you want the plug-in assembly deployed: in the Microsoft Dynamics CRM database, on the server’s disk under <crmwebroot>\server\bin\assembly, or in the GAC. The most commonly specified option is Database while the Disk option is maintained mostly for backward compatibility with Microsoft Dynamics CRM 4.0. If registering your plug-in or custom workflow activity in the database, you can still debug it by following the procedure described in the SDK topic Debug a Plug-in. Finally, select Register Selected Plugins. The assembly and selected plug-ins or custom workflow activities are displayed in the Registered Plugins & Custom Workflow Activities list. However, any registered plug-ins will not execute until you register a step for the plug-in as described in the next topic. On the other hand, custom workflow activities are ready to be included in a workflow. To update or unregister items in the list, other than a system required item, select the item and click Update or Unregister. Alternately, for an update, simply double-click the item. Notice that to update a plug-in you have to update the registration of its assembly. After you have registered an assembly and one or more plug-ins, you can register a step for each plug-in. A step defines when and how you want the plug-in to execute. A plug-in will not execute unless there is one or more steps registered for it. In the view Display by Assembly, select a plug-in in the list and then select Register New Step in the Register menu. The Register New Step dialog box is displayed. The following tables describe the values you can enter or set in the dialog box. The message that must be processed by the Microsoft Dynamics CRM execution pipeline for the plug-in to execute. See the list of messages that support plug-ins. The entity that must be processed by the execution pipeline for the plug-in to execute. No entity value in this field indicates any/all entities. Some messages require a secondary entity. See the documentation on the specific message for more information. A list of entity attributes that, when changed, cause the plug-in to execute. A value of null causes the plug-in to execute if any of the attributes change. When you specify a message that supports filtering attributes, for example Update, an ellipsis … button is displayed that, when clicked, allows you to select attributes from a list. The plug-in that is to be executed. A name for the step. The tool sets a suggested name in the field automatically, but you can change it. Specify the system account that owns any data changes the plug-in makes. The Calling User is the logged on user that initiated the message to be processed. 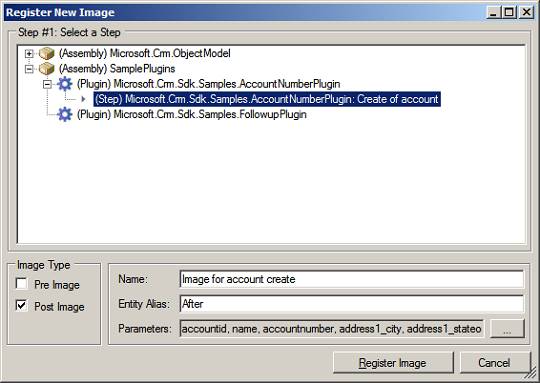 For more information, see the SDK topic Impersonation in Plug-ins. Specifies the order, also known as rank, that plug-ins are executed within a pipeline stage. Plug-ins registered with an order value of 1 are executed first, followed by plug-ins registered with an order of 2, and so on. However, if there is more than one plug-in in a stage with the same order value, then the plug-in with the earliest compilation date is called first. Specifies when you want the plug-in to execute: before (Pre) or after (Post) the core operation that processes the message. For more information, see the SDK topic Event Execution Pipeline. For plug-ins registered to execute in a Post stage, specify if you want them to execute immediately (Synchronous) or queued to execute later (Asynchronous). For post operations, specifying asynchronous execution results in improved system performance as compared to synchronous execution. Specify where you want the plug-in deployed: on the server, on the Microsoft Dynamics CRM for Outlook with Offline Access, or both. For plug-ins developed using the Microsoft Dynamics CRM 4.0 SDK, the plug-ins can execute in one of two supported pipelines: parent and child. For more information, see the Microsoft Dynamics CRM 4.0 SDK topics Parent and Child Pipelines and Execution of Microsoft Dynamics CRM 4.0 Plug-ins. When any asynchronous operation completes, a System Job entity is created to record the completion status. You can view these system jobs in the Web application by selecting Settings, and then click System Job. Check this option if you want plug-in related system jobs automatically deleted when the status is successful. A description of the step. Typically, you can describe the purpose of the step for other developers or administrators that might run the registration tool at a later date. If you have written a constructor for the plug-in that takes one or two string arguments, any string values you specify in these fields are passed to the plug-in constructor at run-time. For more information, see the SDK topic Write a Plug-in. After you register a step, you will see a new step item under the node of the associated plug-in in the Registered Plugins & Custom Workflow Activities list. To register an image, select Register New Image from the Register menu. The Register New Image dialog box is displayed. Follow these steps to register an image with a step. Select an existing step in the list. Specify an image type. A pre-image is a snapshot of the entity’s attribute before the core operation. A post-image is a snapshot of the entity’s attribute after the core operation. Enter a descriptive name for the image. Enter an entity alias. The entity alias value you specify is used by your plug-in code as the key into the image collection. Click the ellipsis … button to select the primary entity attributes that should be included in the image. For improved system performance, only select those attributes that you need. For more information about images, see the SDK topic Understand the Data Context Passed to a Plug-in. When you register a service endpoint you are providing Microsoft Dynamics CRM with the information it needs to communicate with a Windows Azure AppFabric solution endpoint. Once established, this communication channel supports posting the execution context of the message currently being processed by Microsoft Dynamics CRM to the AppFabric Service Bus. Step-by-step instructions about how to register a service endpoint, configure Windows Azure AppFabric ACS, and register a plug-in to post the execution context can be found in the SDK topic Walkthrough: Register an Azure-aware Plug-in with Plug-in Registration Tool. This article provides detailed information about the features of the Plug-in Registration tool and an explanation of the various form fields, settings, and data entry values. The topics covered also provide links to the related SDK documentation for more in-depth research. Try registering some of the sample plug-ins or custom workflow activities provided in the SDK download. Soon, you will be writing and registering your own custom plug-ins or custom workflow activities. Peter Hecke is a programming writer on the Microsoft Dynamics CRM SDK team and is co-author of the SDK since version 1.3. He has also written numerous MSDN technical articles about Microsoft Dynamics CRM.